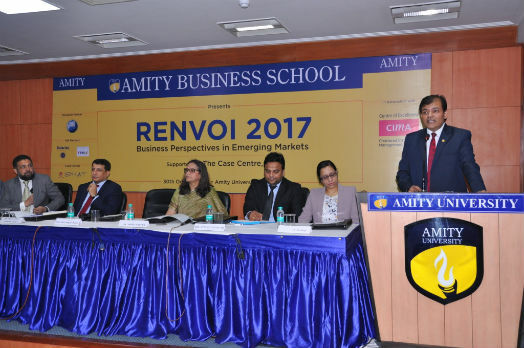 Noida: With the objective of re-strengthening the research excellence and developing new insights amongst students, Amity Business School Noida organized 11th edition of “Renvoi 2017- a Case Study Competition” on the theme Business Perspectives in Emerging Markets at Amity University Noida campus. Renvoi 2017 provided a platform to deliberate upon complex business situations demanding an innovative and re-inventive approach to ensure business sustainability. The aim of the competition was to understand the strategic perspectives of various organizations globally to strengthen their sustainability in the emerging market economy. The competition witnessed submission of more than 40 case studies across the globe including China, United Kingdom, United States, Nigeria and Africa. After rigorous review and appropriateness with the theme, 28 case studies were selected to be presented during the day. 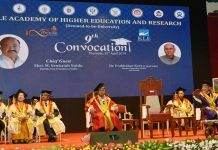 Highlighting the importance of Research, Dr. Sanjeev Bansal, Director, Amity Business School said that research helps students grow in both personal and professional life as it is about re-inventing and re-searching with so many areas to explore. Dr. Bansal opined that research is multi disciplinary which cannot be classified, qualified or quantified. He pointed out that research is a journey which can be successfully completed if a person has passion and dedication. Addressing the gathering, His Excellency Farhod Arziev, Ambassador Extraordinary & Plenipotentiary of the Republic of Uzbekistan shared a brief presentation about Uzbekistan and said that Uzbekistan is a young country with ancient history of great scholars. He emphasized that over the years, relations between the two nations, India and Uzbekistan, have developed exponentially in all spheres. He expressed his country’s interest in International partnerships, especially with Indian Educational Institutions in the area of Research and Science. He averred that the education sector and innovation will fuel the growth of the world. His Excellency Farhod Arziev extended an invitation to Amity University for joint research works and start up projects in association with Uzbekistan’s Universities. Speaking on the occasion, Prof. S. Swarup, Former Deputy Director General, Ministry of Commerce and Industry, Government of India said that in the era of Globalization, need of the hour is to restructure Business Educational Institutions. He stressed that business schools must be equipped with traditional education system and should also teach responsibilities and leadership skills as core values in business education. He averred that having a good idea is not enough but it is important to convert that into a successful business model. Prof. Swarup averred that learning should be interactive in classrooms and suggested that sustainability must be integrated in curriculum of business schools. He pointed out that effective integration with Government departments is required as it is important to educate budding professionals about Government’s rules and regulations. He called upon the business schools to impart training in areas of purchase management, conceptual management and supply chain management to students for providing holistic knowledge of the field. Sharing his views, Dr. R.K. Suri, University Placement Officer Jamia Millia Islamia-Central University, New Delhi said that it is expected from management students to do futuristic research. He highlighted that in coming time, growth of the Nation will neither be led by exports sector nor manufacturing sector or large employees but it will be through domestic consumption, services and small businesses. He called upon the budding professionals to aim high by believing in themselves and also to scale their work. He further added that youngsters are the ones who will drive the future for economic growth by pushing existing boundaries.